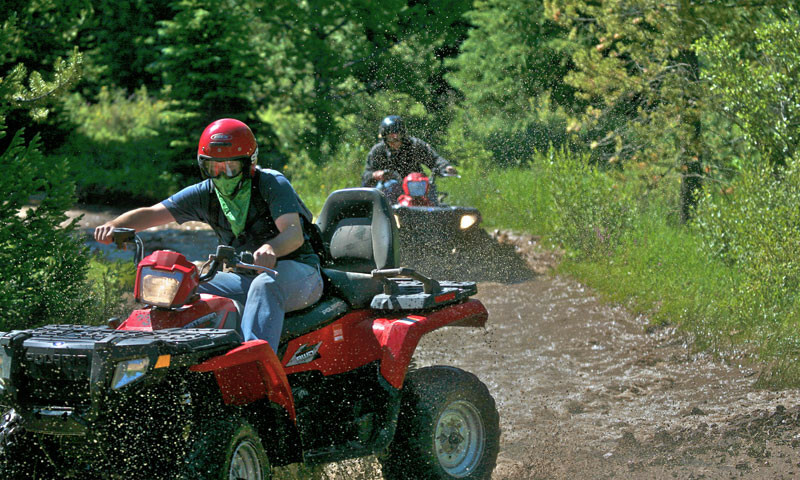 There are a handful of nearby ATV and OHV friendly trails in the great Park City area. ATV tour guides can show you the way or rent an ATV and explore on your own. The outdoor gear and rental center. In summer we feature ATVs, boats, jetskis, as well as SUPs and kayaks. In winter we provide snowmobiles. Guided tours available. Where can I go ATVing near Park City? Mill Canyon: The Mill Canyon OHV Complex begins right in Wasatch Mountain State Park, just south of Park City. Access over 75 miles of ATV/OHV trails from either the Mill Flat or Cascade Springs Trailheads. View the Mill Canyon Trail Map. Wolverine: Located along the northern slope of the Uinta Mountains, the Wolverine/Lily Lake Trail System offers a variety of trails along with nearby camping and great fishing. The road to Lily Lake is easy and great for families or beginners while the Wolverine Loop is long and very technical. You'll need a permit to ride these trails (available at the parking area). Most trails leave right from the Bear River Lodge, roughly 1.5 hours north east from Kamas, Utah along UT-150. I am looking for an ATV tour guide. Look no further. There are a handful of local ATV rentals and guide companies in the area. Check the listings on this page.